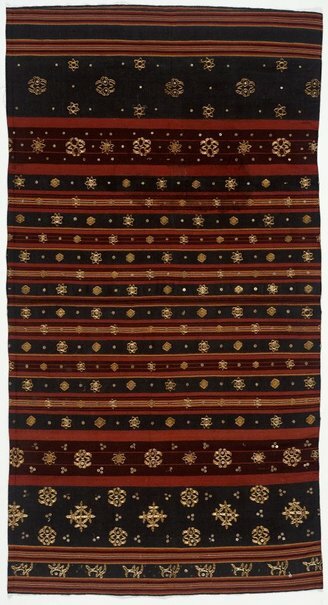 As with other tapis skirts, this one comprises two pieces joined together horizontally at the centre of the skirt. Cotton and bast fibres in a variety of colours, including burnt red, brownish-maroon, blackish-grey, ochre, cream, and pale blue, form the base fabric. In addition to the coloured stripes, couched ('cucuk') gold-wrapped threads, sequins, and pink and clear beads ornament the surface of the skirt. The colours suggest that it comes from north Lampung and was made by a woman following the Pepadon tradition.